Capt. 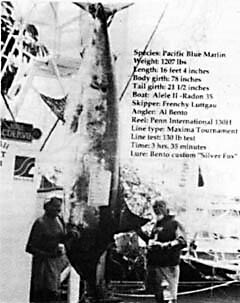 Frenchy Luttgau and Al Bento were fishing on the 35-foot Radon, the ALELE II, when they hooked their grander. The fish ate one of Al's custom Silver Fox' lures being trolling on a Penn International 130-class rig. Al fought the monster for 3 hours and 35 minutes.